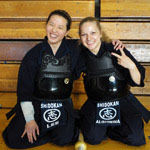 The equipment used for Kendo practice are the bamboo sword (Shinai) and a set of protective armor (Bogu). The bamboo sword is made of four carefully prepared staves or pieces of bamboo that are fitted and held together at both ends by a leather handle, tip, and special string designed to designate the back of the sword. 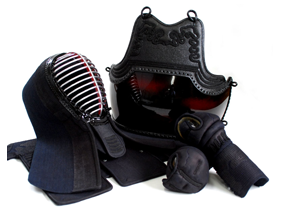 Bōgu (防具) is specially developed protective armour used in Japanese martial arts, kendo and naginata. 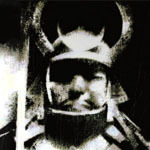 The Bogu is the protective armor worn by Kendoka during training and tournaments. The Bogu is worn over clothing which is comprised of the Keikogi (shirt) and Hakama (traditional pants). A traditional Cotton Wrap called the Tenugui is worn under the Men to provide a base for the Men to fit Comfortably. 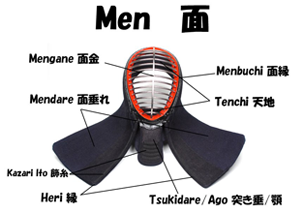 The men protects the face, neck, and shoulders. It consists of a facemask with several horizontal metal bars running the entire width of the face, from the chin to the top of the head. To this is attached a long rectangular thick cloth padding that curves over the top of the head and extends to cover the shoulders. A throat protector is attached to the bottom of the facemask. 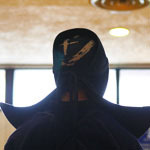 The men is held in place with a pair of woven cords that wrap around the head and are tied at the back. The back of the men is left open for ventilation and the back of the head is unprotected. The part above the temple of the head is considered as a point area. 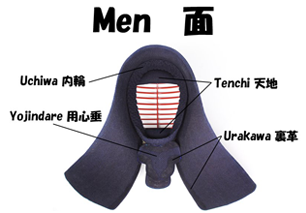 The target areas of the men are the center top, and upper left and right sides for cutting strikes and the center of the throat protector for a thrust. Sho-men (center), Migi-men (right), and Hidari-men (left). Do is subdivided into Migi-do (right) and Hidari-do (left). In general, Do means the right one (i.e. the right side of the opponent). As opposed to the right Do, the left Do is often described as Gyaku-do, which means the opposite Do. In olden times, Samurai wore swords on the left side so it was difficult to cut that side, since the swords could obstruct the blow. Therefore, in order to score on the left Do, the stroke has to be especially precise. The kote are mitten-like gloves.  They were designed expressly for kendo. While appearing to be cumbersome, enough mobility is allowed to grip the shinai in a comfortable, powerful, and firm way. 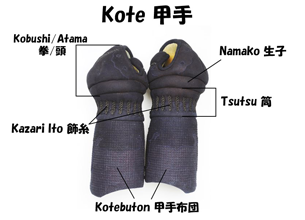 In the past kote were often made with fully articulated fingers. This is rarely seen today as there can be a safety issue with snagged fingers. A special heavily padded design known as oni-gote (鬼小手おにごて) are used by some koryu, most notably Itto-ry. The target area is the wrist portion of each kote. Kote is subdivided into Migi-kote (right) and Hidari-kote (left). In general, Kote means the right one (i.e. the right wriste of the opponent). However, the left one is also considered as a valid point area if the opponent takes an alternate posture in which the left hand is in front. This part is not considered as a valid point area. 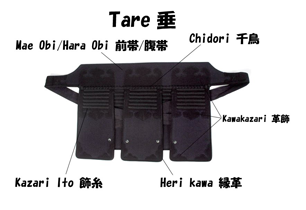 The tare is a thick cloth belt that wraps around the waist and ties under the front flap in front of the groin. Sturdy cloth covered flaps hang from the belt to protect the upper legs and groin. The flaps run along half of the belt's length, which should be positioned over the front half of the body. The center flap is usually covered with a name tag (zekken (ゼッケン), or nafuda (名札 ,なふだ) that identifies the name of the wearer and the dojo or country they represent. There is no target point on tare, it is for protection against off-target and accidental strikes. Shinai (竹刀 ,しない) is a weapon used for practice and competition in kendo and are meant to represent a Japanese sword. Shinai are also used in other martial arts, but may be styled differently from kendo shinai, and represented with different characters. The word "shinai" is derived from the verb shinau (撓う ,しなう), meaning "to bend, to flex", and was originally short for shinai-take (flexible bamboo). Shinai is written with the kanji 竹刀, meaning "bamboo sword", and is an irregular kanji reading. 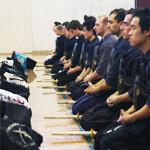 In kendo, the majority of students use one shinai. 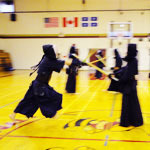 This kendo style has its roots in the tradition of the ittō (一刀 ,いっとう), or one-sword school. However, some kendoka choose to use two shinai, called ni-tō (二刀 ,にとう), a style that has its roots in the two-sword schools of swordsmanship. 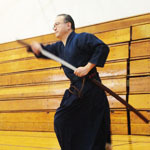 A ni-to combatant uses a long shinai called the daitō (大刀 ,だいとう), which usually held in the left hand, and a shorter shinai, called the shōtō (小刀 ,しょうとう), which is usually held in the right hand. 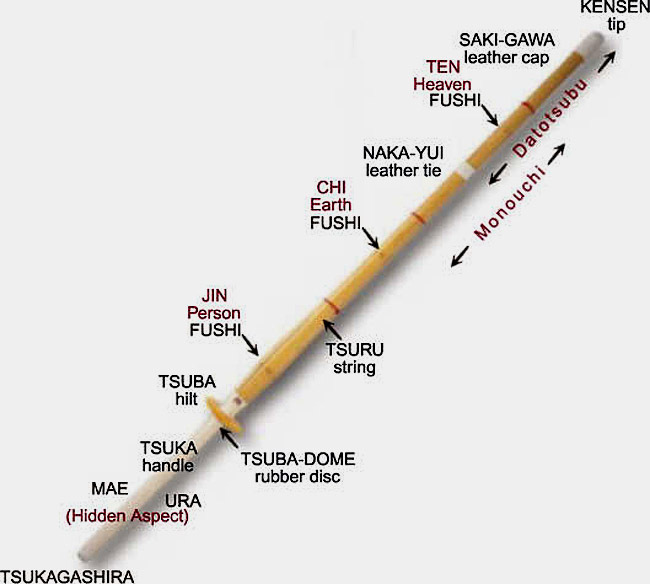 The origin of the shinai can be found in the Edo period. 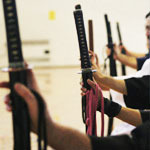 The shinai was developed when a group of swordsmen, in an effort to reduce the number of practitioners being seriously injured during practice, undertook to create a practice weapon that was less dangerous than bokuto (木刀 ,ぼくとう), the hard wooden swords they were previously using. 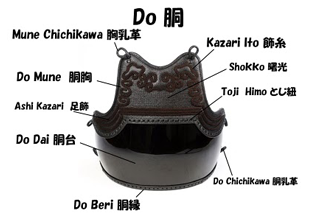 This is also the motivation behind the development of bogu (防具 ,ぼうぐ), the armour that protects the kendoka. 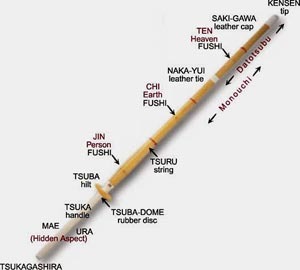 The ancestor of the modern kendo shinai is the fukuro-shinai (袋竹刀 ,ふくろしない), which is still in use in koryu kenjitzu. This is a length of bamboo, split multiple times on one end, and covered by a leather sleeve. This explains the name fukuro, which means bag, sack or pouch. Sometimes the more old and rare kanji tō (韜) is used, but has the same meaning as fukuro. Some schools cover the entire bamboo in the sleeve and add a tsuba, like Kashima Shinden Jikishinkage-ryu does. In Shinkage-ryu, the sleeve is laxquered Kamakura Red, and rather than covering the entire length, is tied off at the non-split end. This particular kind of fukuro-shinai is also called a hikihada (蟇肌 ,ひきはだ), or toad-skin shinai. The name comes from how the leather looks after lacquering; the sleeves are actually made of cow- or horse-hide. Shinai is the sword for Kendo-ka. It is indispensable to use it carefully as you do with a real sword. Therefore, to step over Shinai or to lean on Shinai is out of the question. Keikogi (稽古着 or 稽古衣) or dōgi (道着) is a uniform for training, used in martial arts derived from Japan, or budo. (keiko means practice, gi means dress or clothes). In english, the term keikogi is sometimes referred to simply as the gi, which would be an incorrect use of the word in Japanese. Often keiko is replaced with the name of the Japanese Martial Art being practiced. They say that indigo has sterilizing properties and a hemostatic effect. This is why working clothes in Japan were traditionally dyed with indigo. Hakama (袴) are a type of traditional Japanese clothing. They were originally worn only by men, but today they are worn by both men and women. Hakama are tied at the waist and fall approximately to the ankles. Hakama are worn over a Kimono (Hakamashita). There are two types of hakama, divided (umanori 馬乗り, "horse-riding" hakama) and undivided (andon bakama 行灯袴). The umanori type have divided legs, similar to trousers. Both these types appear similar. 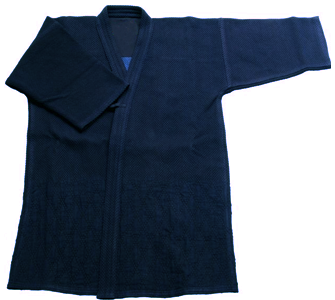 A "mountain" or "field" type of umanori hakama was traditionally worn by field or forest workers. They are looser in the waist and narrower in the leg. Hakama are secured by four straps (himo); two longer himo attached on either side of the front of the garment, and two shorter himo attached on either side of the rear. The rear of the garment has a rigid board-like section, called koshi-ita (腰板), below that is a hakama-dome (袴止め) (a spoon shaped component sometimes referred to as a hera) which is tucked into the obi or himo at the rear, and helps to keep the hakama in place. 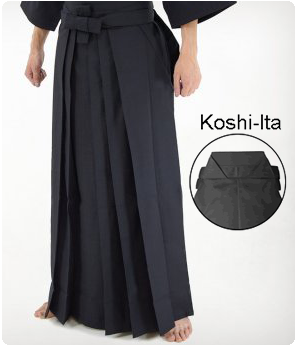 Hakama have seven deep pleats, two on the back and five on the front. The pleats are said to represent the seven virtues of bushido, considered essential the samurai way. Although they appear balanced, the arrangement of the front pleats, (three to the right, two to the left) is asymmetrical, and as such is an interesting example of asymmetry in Japanese aesthetics. The two pleats in the back derive from a verse of a Japanese myth. According to this story, upon the national unification of Japan, the two gods of war helped the god of the sun (the foremost among the Japanese gods) and worked together to manage a nation using only their dignity and without resorting to arms. Each pleat represents a god of war, namely Take-Mikazuchi-no-Kami and Futsu-Nushi-no-Kami. The Koshi-ita, which gathers the two pleats, represents the god of the sun, Amaterasu-Omikami. As a whole, this represents the concept of Wa (harmony). On the other hand, the five pleats in front represent the five principles which one has to hold, that is, Jin (affection), Gi (righteousness), Rei (courtesy), Chi (wisdom), and Shin (sincerity). How to Fold the Hakama?